FBF Panels line the inside of an enclosure to help combat the bleed of sound. Cut from class A fire rated melamine foam, these enclosure liners are shipped in 2’x4’ panel dimensions that measure 1.375” thick. Lined in the center of the panel is a thin layer of our dB-Bloc sound barrier membrane. The composite panel combines to both “block” the escaping noise as well as “absorb” the reflections taking place back inside the enclosed area. FBF Panels are ideal for a cut/paste application on the interior walls of a new or existing shroud or enclosure built around your stationary sound source. 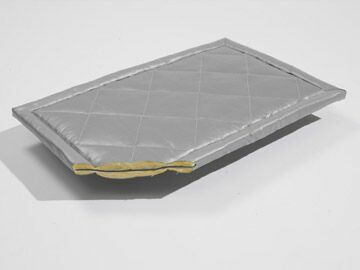 The mylar skin is standard, which helps protect the foam against moisture/oil mist, etc., and also serves to seal the foam sound panels and prevent foam dust from emitting out into the air. 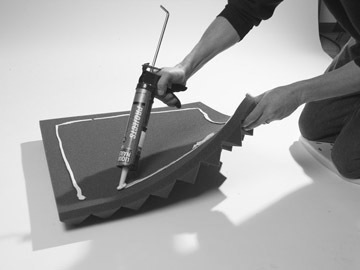 These sound panels can easily be cut with a scissors, and applied to the walls with a tube of silicone adhesive. The panels are lined with dB-Bloc, so there is more weight here than a standard foam sound panel. For adhering to ceilings of an enclosure, consider bracing the panels to the surface with a reinforcing strap or bar. FBF Panels are sold in 2’x4’ sheets for $140 per panel. Orders can be placed by phone at 1-800-638-9355, or using the online tool to the left. A popular alternative to the cut/paste FBF panels is our QBS Sound Barrier Blanket system. Where the FBF is a foam/barrier/foam composite that is cut into smaller 2’x4’ panels, the QBS Blankets are a fiberglass/barrier/fiberglass composite that can be cut up to 25’ tall and serve the same enclosure lining purpose. For smaller projects, clients opt for the FBF panels. For larger products, they switch over and opt for the QBS Blankets. FBF Panels can be cut to match the cavity size of the walls inside your enclosure with a utility knife or box cutter. Then simply glue the panels into place using a silicone based adhesive or construction caulk. 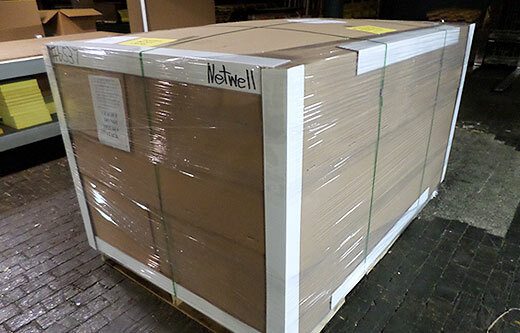 FBF Panels are boxed and shipped via Fedex Ground for smaller orders, or shrunk wrapped on pallets and shipped via common carrier for larger orders. For questions related to your treatment, contact our help desk at 1-800-638-9355. NetWell prides itself on being a teaching website. 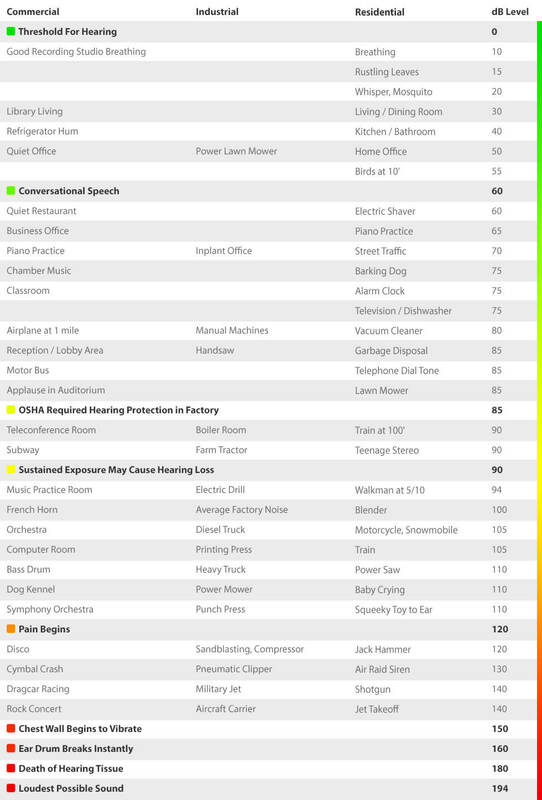 Yes, our goal is to help you solve your noise issues, but just as important is to help you understand how to do it, and do so cost effectively. The support tools below are built for you to help you better understand the art of sound control. We look forward to working with you, and delivering back a more user-friendly space. BP.